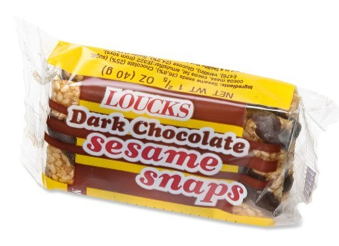 While standing in line, waiting to purchase my super cute shoes at REI, these Loucks dark chocolate sesame snaps caught my eye. I love chocolate and I like sesame seeds, let’s just have a gander and see if they are vegan. Low and behold they are! So I got a couple packs and couldn’t wait until I got home to try them. I didn’t wait and promptly opened a pack in the car, they did not disappoint with a nice sesame snap and smooth chocolate taste. They make a great snack and satisfy any mid-afternoon chocolate craving.